Arts & Music: Happy Birthday Bach! Take a few homeschool minutes today to introduce your students to a tiny masterpiece by one of the world’s great composers, Johann Sebastian Bach, born on this day in 1685. Saturday is Arts & Music Day at the River Houses, and in honor of the birthday of Johann Sebastian Bach (1685–1750), why not play his famous four-minute “Little Fugue” this week as background music in your little homeschool academy. If either of those performances catch your students’ attention, there’s a whole universe of Bach available online — more than enough to convert today’s little homeschool lesson into a week-long music festival of your own devising. What artistic discoveries have you made in your homeschool lately? ❡ Explore more: You can find several lists of noted musical composers and performers on pages 214–222 in your recommended world almanac (riverhouses.org/books). Why not use those lists to make up an impromptu homeschool research project: have your students copy out separate lists of composers from different centuries, or from different countries, and find examples of their music online. Can you get a sense for how musical styles changed from century to century? Are there distinct national styles that you can recognize? 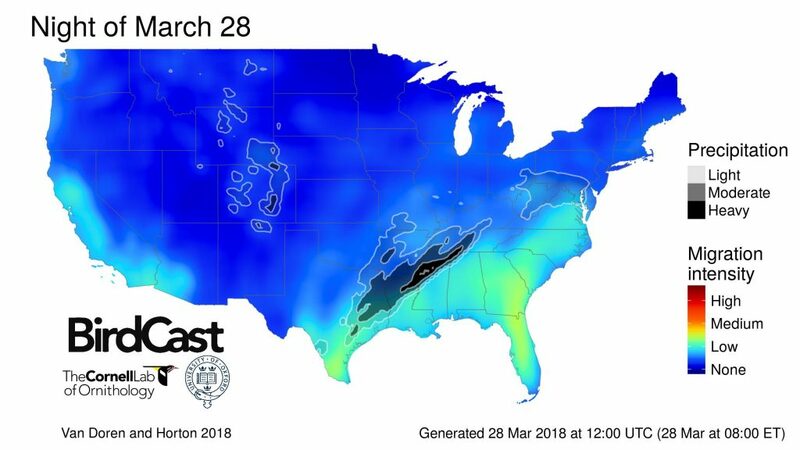 BirdCast’s daily maps outline where migration is going to be heaviest, and so where you are more likely to see new spring arrivals on any given day. You can study the forecast maps as an educational tool, and also use them to support your own homeschool field trips. (“This weekend looks especially good for migrants — let’s take a trip to the local lake tomorrow and see if we can find any new arrivals.”) Bookmark BirdCast.info and share it with your students as the migration season progresses. What nature notes have you taken in your homeschool lately? ❡ Books in the running brooks: Our recommended River Houses reference library (riverhouses.org/books) includes an excellent bird guide that would serve your homeschool well. Many other similar guides are also available — find one that is a good fit for your family and take it with you on all your outings, whether far afield or just to the backyard. It’s Wonderful Words Wednesday at the River Houses, and since Monday was Robert Frost’s birthday, we’re going to make this into a Robert Frost week! Robert Frost (1874–1963) is an excellent poet to read with young people because his writing is often simple and accessible on the surface (and so easy for beginners), while remaining complex and philosophical underneath (and so rewarding for more advanced readers). ❡ Count and map: When you introduce your students to a new poem, especially one in a traditional form, don’t start with abstract meaning or symbolism; the first thing to do is just count the syllables and map the rhyme scheme. How many syllables in each line in this poem? Ten throughout — a perfect pattern. What about the rhyme scheme? Each pair of lines rhymes — they are couplets — so we would describe the rhyme scheme as AABBCCDD, etc. Uncovering these structural details teaches your students that a poem of this kind is not the result of some sort of spontaneous imaginative outburst on the part of the poet; it is instead an intricately crafted piece of literary labor. What wonderful words have you found and what literary discoveries have you made in your homeschool lately? ❡ Explore more: The American Literature website (americanliterature.com) includes biographies and examples of the work of many major poets, including Robert Frost, suitable for homeschool students and teachers. Suppose you had put together a book that people were still using and copying a thousand years later. That would be quite an achievement! So it was for Eusebius Sophronius Hieronymus and his Latin translation of the Bible, the “Vulgate” or common translation. Eusebius Sophronius Hieronymus is better known today as Jerome, the Anglicized version of Hieronymus, and as Saint Jerome in several different Christian denominations. Tuesday is our regular Books & Libraries Day at the River Houses, and tradition says that this Tuesday (27 March) is Jerome’s birthday, so why not spend a few homeschool minutes introducing your students to one of the most influential texts in Western history, Jerome’s Vulgate Bible. Jerome was a fourth-century scholar of Classical (Greek and Latin) literature who converted to Christianity and took up the study of the original Hebrew and Greek texts of the Old and New Testaments. As Christianity spread through the Roman empire, Jerome’s Latin translation of the Hebrew and Greek originals became the standard version of the Bible used in most Western churches for more than a thousand years. Do you have Latin students in your homeschool? 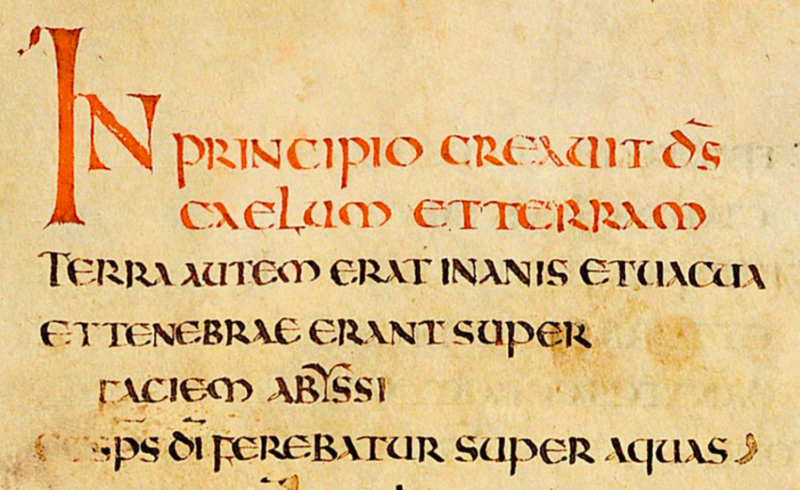 See if they can make out the opening lines of the Codex Amiatinus, written in red (rubricated): “In principio creavit d[eu]s caelum et terram” (“In the beginning God created the heaven and the earth”). Follow the link to the full text above and see how far, with a little practice, they can get. Yesterday (25 March) was the birthday of the most important person in history that you may never have heard of: Dr. Norman Borlaug, born 25 March 1914 in the little town of Cresco, Iowa. Borlaug was an American agronomist who developed important new strains of wheat and helped distribute them to impoverished regions of the world in what has been called the “Green Revolution” of the mid-twentieth century. By some estimates, Borlaug’s work saved a billion people from starvation. He was awarded the Nobel Peace Prize for his work in 1970. Take a few homeschool minutes this week to introduce your students to Norman Borlaug, one of history’s greatest humanitarians. What museum or historical monument have you visited with your homeschool students lately? Happy Birthday to the great American poet Robert Frost, born on this day in San Francisco in 1874. I sha’n’t be gone long. — You come too. ❡ Explore more: The Simple English Wikipedia article on Robert Frost (simple.wikipedia.org) is a fine account to read your homescholars today — or to ask them to read to you! What holidays or anniversaries are you marking in your homeschool this week? 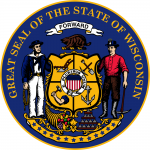 WISCONSIN (the 30th state, 29 May 1848) — The Badger State. Capital: Madison. Wisconsin can be found on page 591 in your almanac and on plates 41 and 142 in your atlas. Name origin: “Indian name, spelled Ouisconsin or Mesconsing by early chroniclers, believed to mean ‘grassy place’ in Chippewa. Congress made it Wisconsin” (almanac page 423). State bird: American Robin. Website: www.wisconsin.gov. ❡ Explore more: If you’re planning a comprehensive study of one or more of the U.S. states, be sure to investigate the excellent collection of primary source materials for teachers available from the Library of Congress (loc.gov/teachers/classroommaterials/primarysourcesets/states). And the delightful State Symbols USA site (statesymbolsusa.org) has everything you and your students will want to know about flags, seals, mottos, state birds, and much more. 🇲🇳 MONGOLIA, in Central Asia. Population: 3,068,243. Capital: Ulaanbaatar. Website (in Mongolian and English): www.president.mn. 🇲🇪 MONTENEGRO, in southeastern Europe. Population: 642,550. Capital: Podgorica. Website: www.gov.me. 🇲🇦 MOROCCO, on the north coast of Africa. Population: 33,986,665. Capital: Rabat. Website (in Arabic and several other languages): www.maroc.ma. 🇲🇿 MOZAMBIQUE, on the southeast coast of Africa. Population: 26,573,706. Capital: Maputo. Website (in Portuguese): www.portaldogoverno.gov.mz. These all appear in your current almanac, atlas, and history encyclopedia as well. For example, you’ll find the main entries for Mongolia on almanac page 806, atlas plates 88 and 136, and history encyclopedia page 589, with illustrations, flags, and other mentions available through the indexes in each volume. What geographical discoveries have you made in your homeschool lately? ❡ Little lessons: “Did you know that the vast empire assembled by the twelfth-century Mongolian warlord Genghis Khan extended from Iran in the west all the way to the Sea of Japan in the east?” You can find a helpful homeschool review of this important period in the history of Asia on pages 164–165 in your River Houses history encyclopedia (riverhouses.org/books). 🌔 THE MOON at the beginning of this week is gibbous and waxing, heading toward full on the last day of the month. Track the moon’s phases each month at timeanddate.com/moon/phases, and dial up this week’s constellations with your River Houses star atlas (riverhouses.org/books). 🗓 TODAY (Sunday, 25 March) — Today is the 84th day of 2018; there are 281 days remaining in the year. Learn more about different kinds of modern and historical calendars on pages 351–357 in your River Houses almanac (riverhouses.org/books). ⬩ Today is also the birthday of the American agronomist Norman Ernest Borlaug (1914–2009), who saved more human beings from starvation than any person in history. Monday (26 March) — Monday is Museums & Monuments Day at the River Houses. In honor of Norman Borlaug’s birthday week, we’re going to pay a virtual visit to the Norman Borlaug Heritage Foundation in Cresco, Iowa. ⬩ Monday is also the birthday of two famous poets, the Englishman A.E. Housman (1859–1936) and the American Robert Frost (1874–1963) ⬩ On this day in 1812 a Boston political cartoonist coined the word “Gerrymander” by merging future Vice President Elbridge Gerry with a salamander. Tuesday (27 March) — Join us for Tuesday Tea at the Library and some notes on books, libraries, and history. Since today is the birthday of the early Christian saint and scholar Jerome (A.D. 347–420), we’re going to spend a few homeschool minutes learning about his Latin translation of the Bible — the Vulgate or common translation — which served as the standard text of scripture throughout much of Christendom for more than a thousand years. Wednesday (28 March) — Today is the birthday of the Czech scholar and educator John Amos Comenius (1592–1670), who is often credited with having written the first picture book for children, Orbis Pictus (1658). Friday (30 March) — Our regular Friday Field & Nature Notes will take a look at the ongoing spring migration. ⬩ Today also is the birthday of the famous Dutch painter Vincent van Gogh (1853–1890). Saturday (31 March) — Saturday is Arts & Music Day at the River Houses, so we will spend some time with two of the world’s great composers, both born on this day: Johann Sebastian Bach (1685–1750) and Franz Joseph Haydn (1732–1809). 🌎 EVERYTHING FLOWS: Mongolia is one of our countries-of-the-week, so our Weekly World River is the Orkhon River, which rises in Mongolia’s Khangai Mountains and flows northward to the Russian border. You can chart its course in your River Houses atlas (riverhouses.org/books), and you can read much more about it in the comprehensive Orkhon River entry in Wikipedia or on your next visit to your local library. William Morris (1834–1896) was one of the most gifted and prolific artists of the Victorian period in British history, and on this anniversary of his birth, why not spend a few homeschool minutes introducing your students to his beautiful designs. Morris was a polymath who wrote novels and poetry, designed textiles and stained glass windows, and established a press that produced some of the most beautiful books of the nineteenth century. His designs for fabrics, carpets, and wallpaper continue to be popular more than a century after his death. “Have nothing in your houses that you do not know to be useful or believe to be beautiful,” Morris wrote. That’s a worthy aspiration for us all. And if you want something in your house that is both educationally useful and beautiful, what could be better than a William Morris coloring book! ❡ Explore more: For a brief homeschool overview of the Victorian period in British history, to which William Morris belongs, turn to pages 348–349 in your recommended River Houses history encyclopedia (riverhouses.org/books). Nature Notes: Start Your eBird List Today! We love natural history at the River Houses, and one of the simplest and most educational ways to introduce your homeschool students to natural history is by keeping a simple bird list for your backyard or local area. Spring is on its way, so this is the perfect time to start. eBird allows you to specify a location (your backyard, for example, or a local natural area), and then add regular lists of birds seen at that location. To build up an effective list (the most useful for educational purposes) you should set aside a small block of time — 15 minutes or 30 minutes, say — and count all the birds you see during that time. It may be only five birds, or it may be fifty, but by keeping a total count for a specific period of time every week, eBird can automatically build up a profile of your location, showing when different species arrive, when they depart, and how frequent they are. That’s a valuable picture of the natural world that your students can learn from. If you and your students get really ambitious you can even add pictures and sounds to your eBird records. Tuesday is Books & Libraries Day at the River Houses. Today is the first day of spring, and it’s also the birthday of the early American poet Anne Bradstreet (1612–1672). Why not remember her to your homeschool students this week, and share with them a few of Bradstreet’s lines on motherhood. What literary and educational discoveries have you made at your library lately? Today is the March equinox — we call it the vernal or spring equinox in the northern hemisphere, but in the southern hemisphere it’s the autumnal or fall equinox. The two solstices, in December and June, occur at the points in the earth’s annual orbit when the planet’s axis is tilted most directly away from the sun, and most directly toward the sun, respectively. 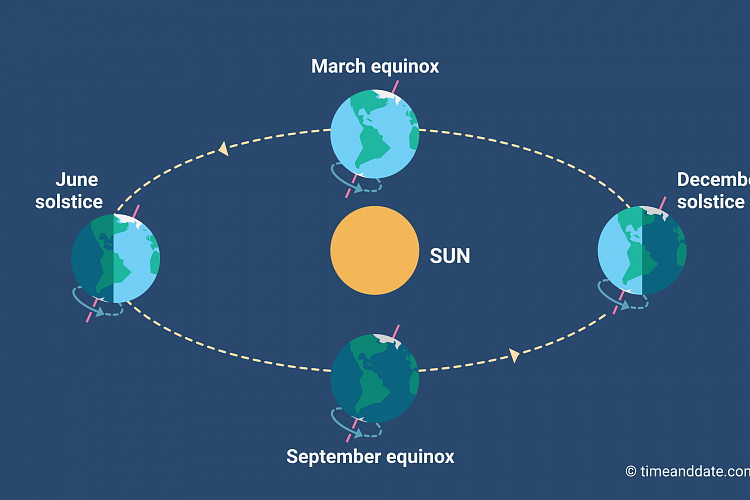 The two equinoxes, in March and September, occur when the earth’s axis is “sideways” to the sun (so to speak), making the intervals of daylight and darkness equal (or very nearly so). Monday is Museums & Monuments Day at the River Houses: spend a few homeschool minutes exploring a notable cultural or historical site and broaden your homeschool horizons. Learn a new name or a new date, find a new location on a map, chat with your students about a fact or an idea of interest, and your little lesson is done. WATERLOO – Iowans who bleed gold and green will want to plan a trip to Waterloo’s newest museum dedicated to the history of the John Deere tractor. It opened Tuesday next to the company’s Waterloo Works facility…. The museum is split into several galleries. The first gallery, ‘Working the Land,’ features exhibits that detail what agriculture was like before the Industrial Revolution. One interactive exhibit simulates how difficult it is to hold a walking plow steady. Another allows visitors to compare their own strength to that of a horse. ‘We wanted to show how we have used technology to make work easier,’ said Josh Waddle, museum curator. The other galleries deal specifically with the history of John Deere’s tractor lines, how a tractor is made, the dealers who have sold John Deere tractors over the years and the employees who have worked at the Waterloo Works plant. Several of the museum’s docents, who wear black shirts, are retired employees who can share their expertise and experiences with visitors…. 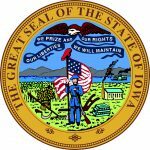 IOWA (the 29th state, 28 December 1846) — The Hawkeye State. Capital: Des Moines. Iowa can be found on page 572 in your almanac and on plates 39 and 142 in your atlas. Name origin: “Indian word variously translated ‘here I rest’ or ‘beautiful land.’ Named for the Iowa River, which was named for the Iowa Indians” (almanac page 423). State bird: American Goldfinch. Website: www.iowa.gov. ❡ Explore more: If you’re planning a comprehensive unit study of one or more of the U.S. states, be sure to investigate the excellent collection of primary source materials for teachers available from the Library of Congress (loc.gov/teachers/classroommaterials/primarysourcesets/states). And the delightful State Symbols USA site (statesymbolsusa.org) has everything you and your students will want to know about flags, seals, mottos, state birds, and much more. 🇲🇽 MEXICO, in southern North America. Population: 124,574,795. Capital: Mexico City. Website (in Spanish): www.gob.mx. 🇫🇲 MICRONESIA, in the western Pacific Ocean. Population: 104,196. Capital: Palikir. Website (in English and Japanese): micronesia.fm. 🇲🇩 MOLDOVA, in Eastern Europe. Population: 3,474,121. Capital: Chișinău. Website (in Romanian, English, and Russian): www.moldova.md. 🇲🇨 MONACO, on the Mediterranean coast of France. Population: 30,645. Capital: Monaco. Website (in French and English): www.gouv.mc. These all appear in your current almanac, atlas, and history encyclopedia as well. For example, you’ll find the main entries for Mexico on almanac page 804, atlas plates 47 and 136, and history encyclopedia page 500, with illustrations, flags, and other mentions available through the indexes in each volume. Quick Freshes are our regular Sunday notes on the homeschool week ahead. Pick one or two (or more!) of the items below each week and use them to enrich your homeschooling schedule! ❡ Little lessons: “Did you know that the tiny European nation of Monaco — a complete independent country — has an area of less than one square mile?” You can find a facts-and-figures outline of Monaco on page 806 in your River Houses almanac and on plate 136 in your atlas, with a map of the country (look close!) on atlas plate 63 (riverhouses.org/books). 🗓 TODAY (Sunday, 18 March) — Today is the 77th day of 2018; there are 288 days remaining in the year. Learn more about different kinds of modern and historical calendars on pages 351–357 in your River Houses almanac (riverhouses.org/books). ⬩ Today is also the birthday of Wilfred Owen (1893–1918), one of the great poets of the First World War. ⬩ On this day in 1965, cosmonaut Alexey Leonov became the first man to walk in space. Monday (19 March) — Monday is Museums & Monuments Day at the River Houses. Since Iowa is our state-of-the-week (and tomorrow is the first day of spring), we’re going to pay a virtual visit to the John Deere Tractor and Engine Museum in Waterloo, Iowa. Wednesday (21 March) — Wednesday is Wonderful Words Day at the River Houses. This Wednesday, spend a few homeschool minutes with us reading a verse or two for the beginning of spring. Thursday (22 March) — Today is the birthday of Randolph Caldecott (1846–1886), the English artist famous for his illustrations of children’s books, and for whom the annual Caldecott Medal was later named. Friday (23 March) — Our regular Friday Field & Nature Notes will take a look at the ongoing spring bird migration season. (Did we mention it’s really spring?) ⬩ On this day in 1775, on the eve of the American Revolution, Patrick Henry delivered his famous “Give me liberty, or give me death!” speech at St. John’s Episcopal Church in Richmond, Virginia. Saturday (24 March) — Saturday is Arts & Music Day at the River Houses. Spend a few homeschool minutes this week introducing your students to the beautiful work of the multi-talented nineteenth-century artist, textile designer, typographer, and poet William Morris, born on this day in 1834. 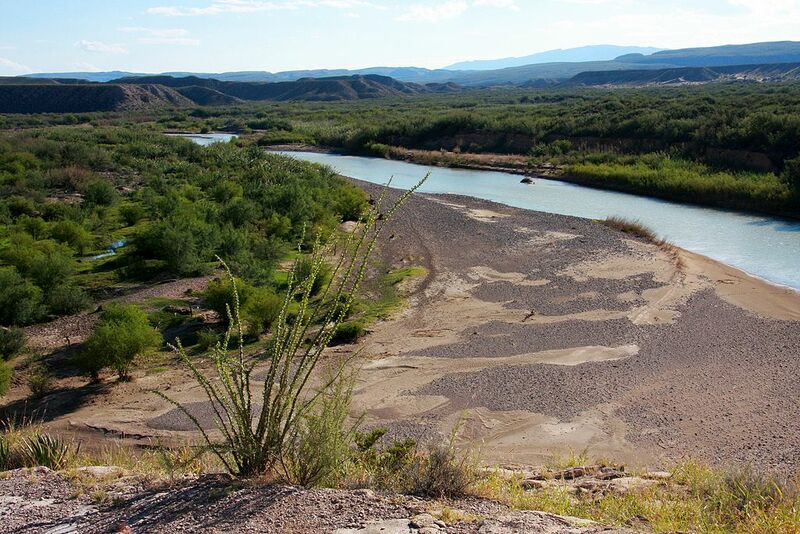 🌎 EVERYTHING FLOWS: Mexico is one of our countries-of-the-week, so our Weekly World River is the Rio Grande, which rises in the U.S. state of Colorado but then flows south and forms part of the border between Mexico and the United States. You can chart its course in your River Houses atlas (riverhouses.org/books), and you can read much more about it in the comprehensive Rio Grande entry in Wikipedia or on your next visit to your local library.